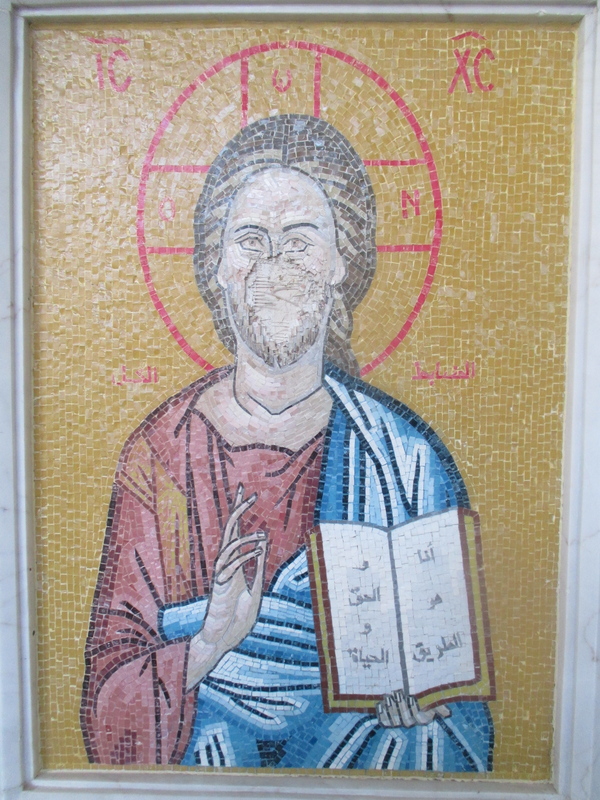 I am in Beirut, Lebanon, for the fourth time since 2010, when I first came and was introduced to my Presbyterian brothers and sisters in this small country by the Mediterranean Sea. 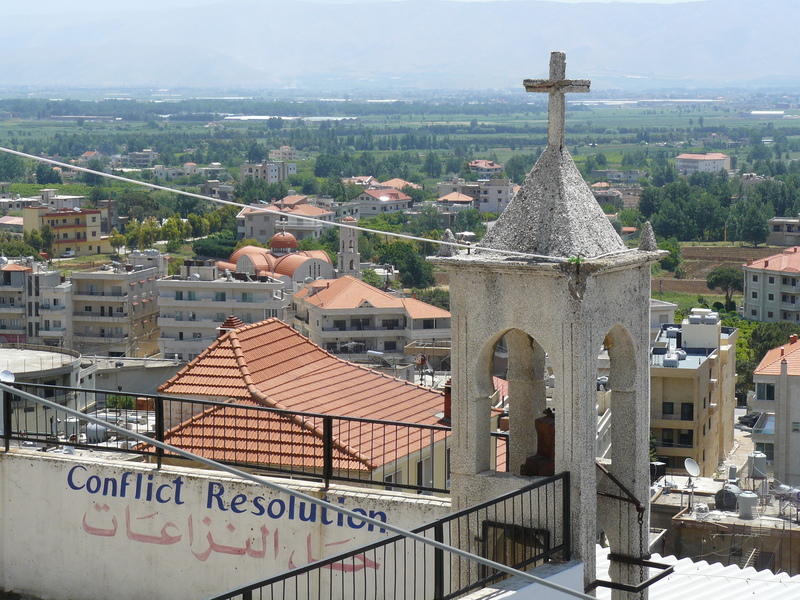 We spent about four or five days here on that trip visiting various expressions of the National Evangelical Synod of Syria and Lebanon (NESSL), whether the leadership of the synod, the pastors and churches, a beautiful mountainside elder care facility or a brand new school in the Bekaa Valley. These are amazing, resilient, intelligent and educated people. The evangelical, or reformed, church took root here in the 1830s as American missionaries came in the great movement of that century. 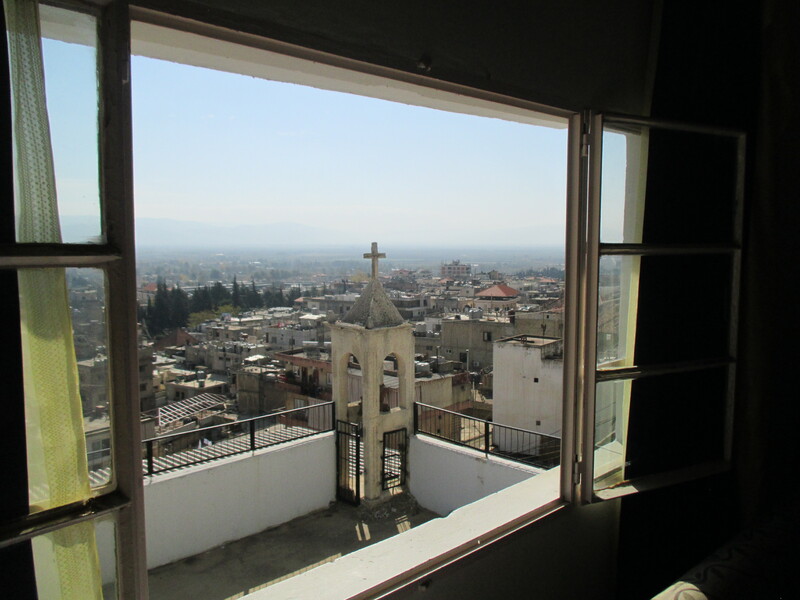 We also spent a week in Syria, visiting the ancient cities of Damascus and Aleppo and the Syrian parts of NESSL, as well as historic places such as the Street called Straight and the Ananias House (see Acts 9), the Grand Ummayyad Mosque in Damascus, and the ancient maze-like souq and the citadel in Aleppo. These are old places bearing the marks of an ancient church as well with names like Chaldean, Maronite and Melkite Catholic, and Greek, Armenian and Syrian Orthodox. Christians have walked here since the first Pentecost after the resurrection. 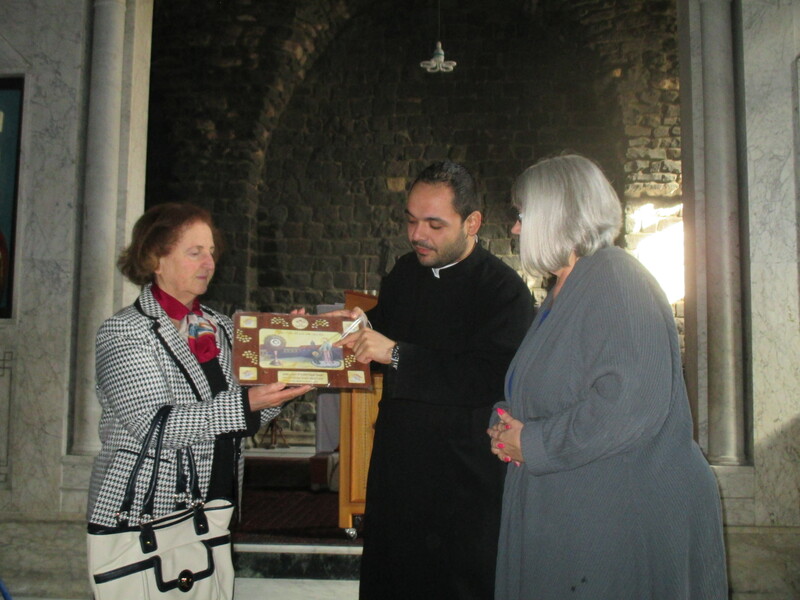 In 2010 in Lebanon we learned how the church had a prominent role in offering hope and witness during the civil war here that lasted from 1975-1990, and we also saw how the church in Syria offered that same hope and witness to refugees who had fled from the Iraq war to their east, beginning in 2003. 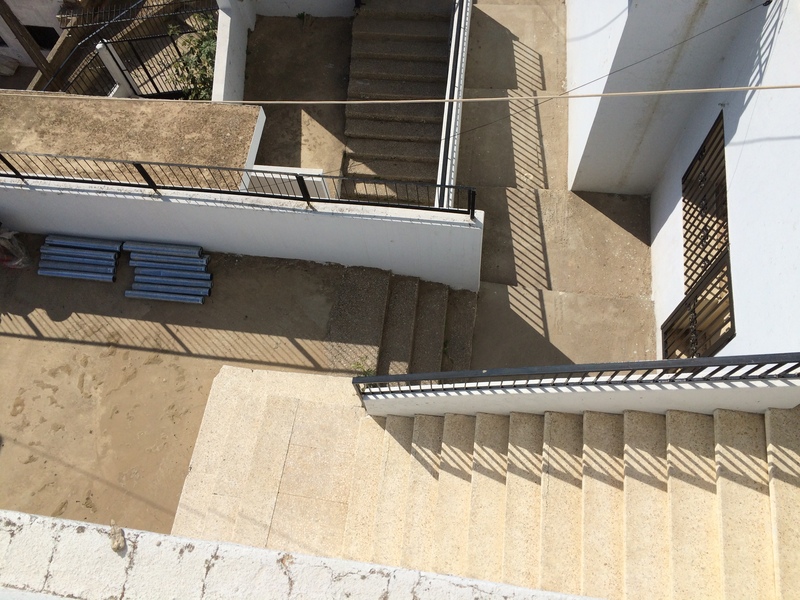 Looking down at the stairs below from top of the Kab Elias school, now apartments for refugees. 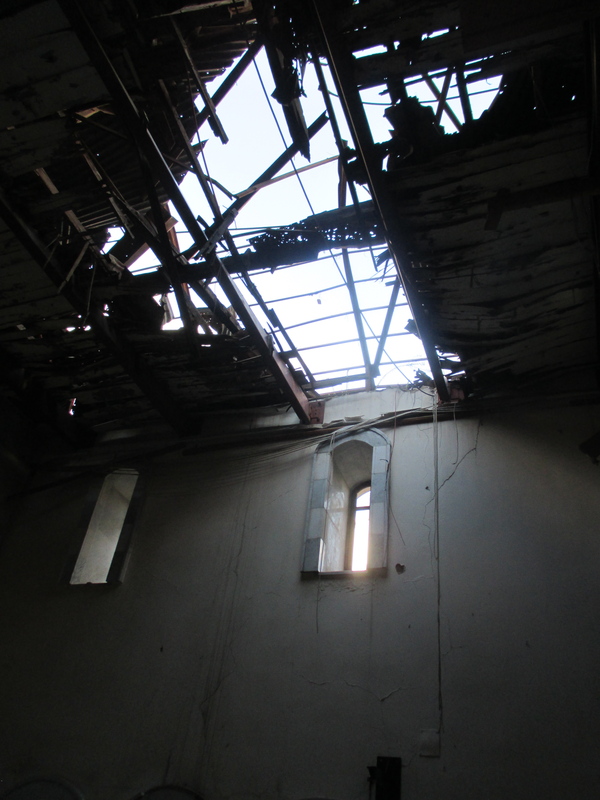 Returning to Lebanon in 2013, there was a completely different set of circumstances. The new war being fought was in Syria and had been going on for two years at the time of that trip. Refugees from that war had found their way to Lebanon as well as being internally displaced in Syria. And what we found was that same church offering hope and witness anew. Now, in November, 2014, the crisis has increased ten and maybe a hundredfold. There seems to be no end to the streams of people being forced out their homes in one place, carrying only what their hands can hold, and setting out in a vast migration to a new place. And hopefully one where they can find at least a semblance of peace. Syrians – maybe a million or more – have come to Lebanon, a country of only four million people. They live in tents. There is really no infrastructure for their children to go to school. There are no jobs. But at least the war and the bombs and the killing machine are on the other side of the mountains. About halfway up the stairs of the former Kab Elias Evangelical School compound there is a door to your right. Inside is the small church where worship is still held on Sundays. 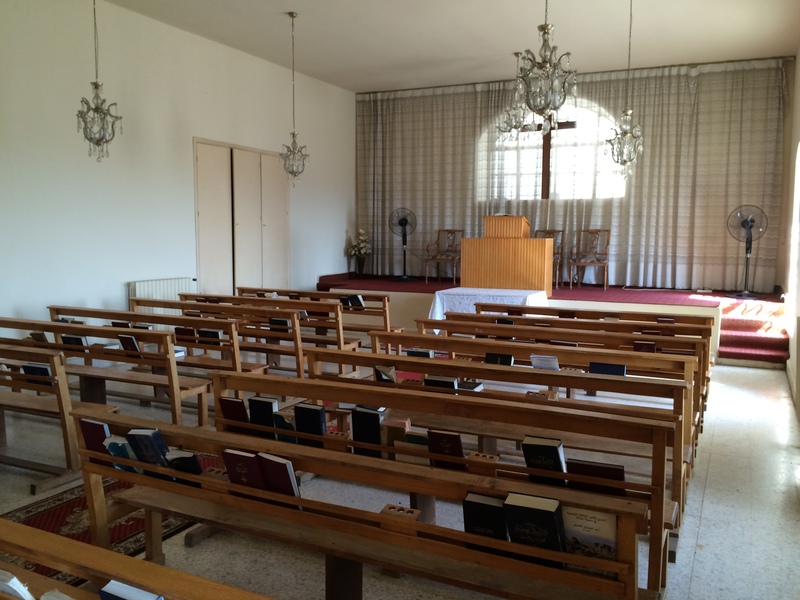 Now part of the worshiping community are the refugees from Syria who are living here. But one thing that is common on both sides of the mountain is the church. It is a common and constant presence in Syria and Lebanon. The church is here. God is here. Hope is here. In 2013 we had the chance to visit one of those places of hope. NESSL was refitting an old, now unused school to become apartments for refugees from Syria. Rooms where once uniformed students learned reading and math and science, would be transformed into bedrooms and kitchens and bathrooms. There was even a small church here and that would remain as a weekly gathering place to come together and worship the God of peace and salvation and to study his word in the Bible. Walking up the hundred-plus stone stairs of this multi-level compound, we saw workmen installing kitchen equipment and making bathrooms for the families who would eventually call this place home. All of those items needed for daily living – sinks, toilets, cooking stoves, refrigerators, heating stoves – had to be hauled up those stairs that had been worn by years of small feet going up and down to learn the lessons of life. Now they would be trod by families who had learned the lessons of war and fear, and would find peace in this place of God. Yesterday upon my return here, I met three of the families who have found refuge here. There was Ziad from Homs, who was sharing his apartment with another young, single man who was not there when we arrived. Homs is a city that had been under siege for a full three years, having been liberated just this past May. I am sure if we had more time and more ability to communicate, we could have heard some horrible stories from Ziad, but also stories of escape and survival. His simple room contained a small bed, a chest with a television on top and some meager mementos from home. It looked like a college dorm room. Young men really don’t need much, do they? Another room was occupied by Dunia, who had come from Safita in the northwest. Her apartment was much cozier, made so by a beautiful rug on the floor, a couch and chairs in the living room and a few more reminders of her home. Her son was living there with her and he has been recruited by a local Christian leader in helping others. 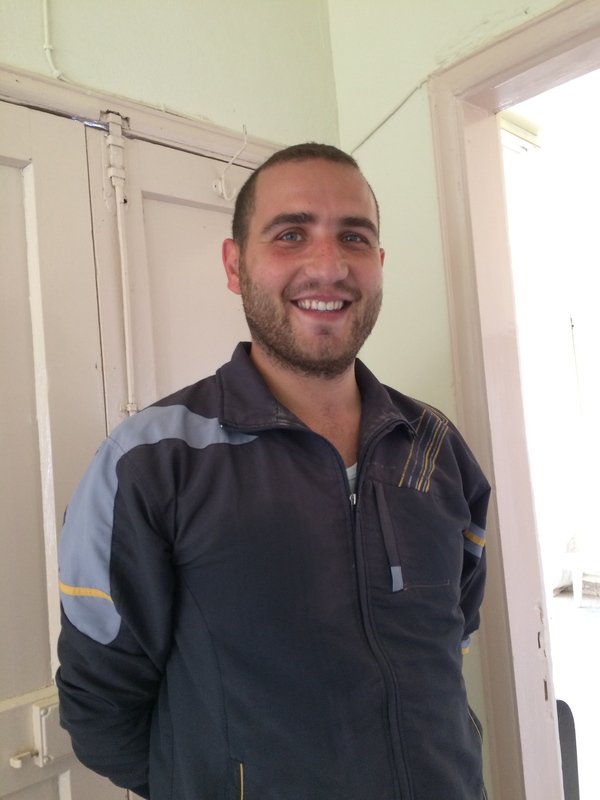 He has applied for admission to the Near East School of Theology in Beirut with the hope of studying to be a pastor. These are seeds of hope being planted for the future of his land. Climbing to the very top level of this vertical compound we met Elder Moussa from Aleppo and his daughter Fibi. Elder Moussa was an electrical engineer by trade and one day his skills will be needed desperately as a city of two million people will have to be rebuilt. We have heard that 55% of Aleppo has been destroyed; ISIS is active there and soon the government forces will try to surround them and deprive them of weapons and supplies to snuff them out. There is more tragedy still to be experienced in the months to come. There is still an active Presbyterian congregation there meeting in a fifth floor apartment with no electricity or water, led by a courageous pastor named Ibrahim Nsier. But that is another story. 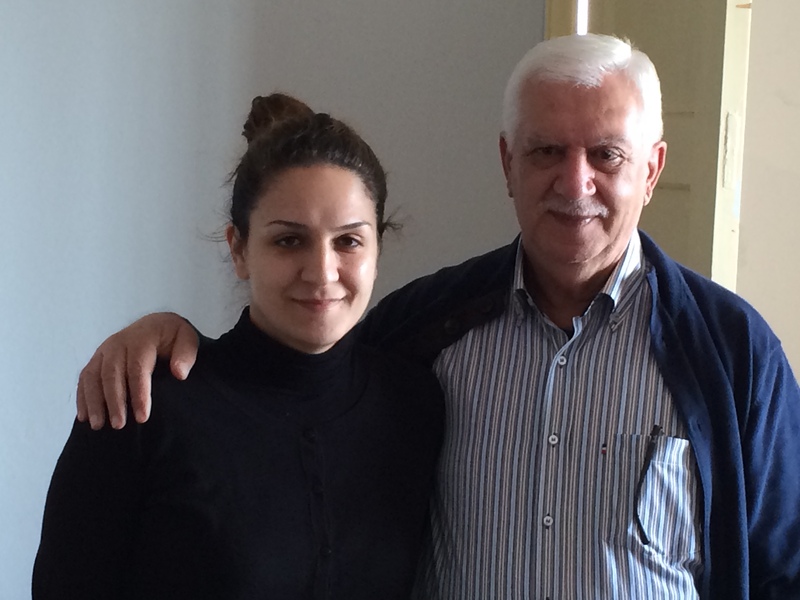 Elder Moussa of the Aleppo Presbyterian Church and his daughter Fibi. Let me tell you why Moussa and his daughter Fibi and her sister Grace were in this apartment at the top of the stairs. They had not fled Aleppo in fear for their lives. Indeed, they were a part of that congregation still meeting there in an equally high place at the top of five flights of stairs. 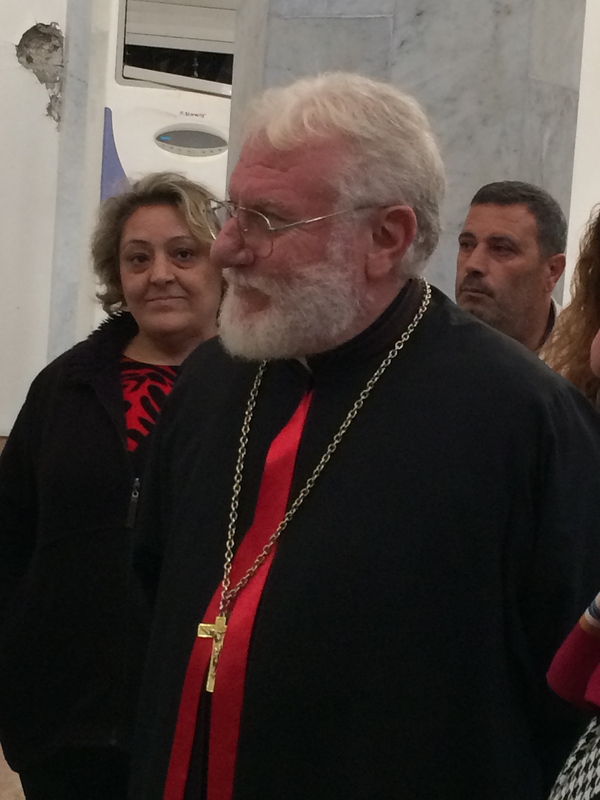 Moussa is an elder there (and I most likely met him in that church in 2010). He is a leader, seeing to the spiritual needs of that congregation. But his wife had cancer. Oh, how I curse cancer! 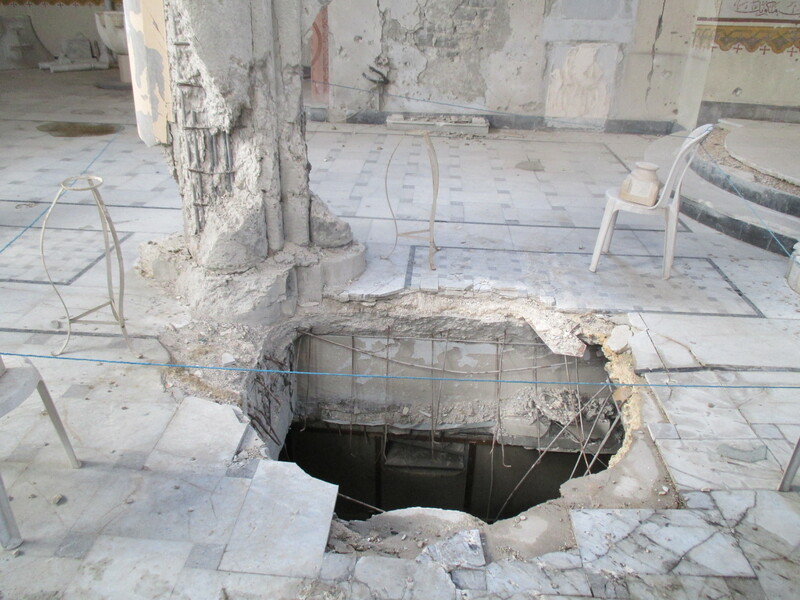 His wife had cancer and there were no longer working hospitals or even doctors in Aleppo. (Think about that for a minute. In a city of two million people, what used to be a modern 21st-century city, there were no working hospitals.) 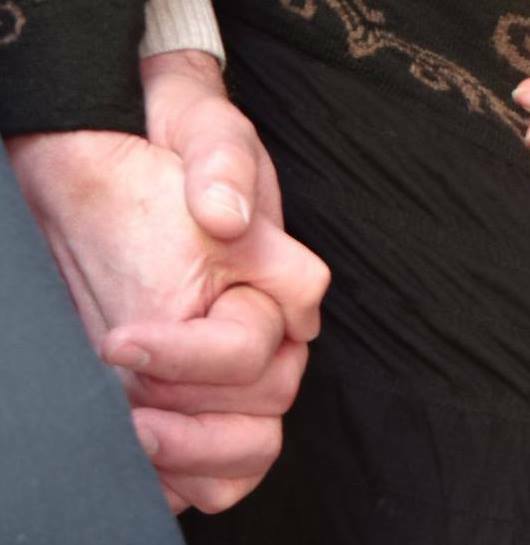 Moussa and Fibi and Grace left with wife and mother to find treatment in Latakia to the west. Moussa’s wife died two months ago. This man, who is probably only in his early 60s, this educated electrical engineer who owned his house and raised his family with a wife of decades, now lives with his daughters at the top of the former school. A widower, he can look out the window to the mountains, knowing she is not buried in her homeland, but that she is in the arms of a loving God. This is the view out of Dunia’s window, looking to the church steeple with its bell. A loving God, who has led him to this place for this time. A loving God who will see him come home, either to Aleppo to help rebuild or to one of the mansions in his father’s house. A loving God who walks up the stairs with him to the top of the school, now made home. A loving God who walks among the thousands of tents in the valley below. A loving God he worships in the small church a few flights below. A loving God embodied in the churches and pastors and flocks of this place. I pray a prayer of thanksgiving to this loving God for allowing me to enter into the lives of these people who are living in a place prepared for them by brothers and sisters of mine and yours. And I pray to this God for peace in this land. Praise God from whom all blessings flow, praise him all creatures here below. Praise him above ye heavenly host. Praise Father, Son and Holy Ghost. We are traveling as members of a church with other members of other churches to be with still more members of yet other churches. And yet, we are all one church, part of the body of Christ. My travel companion (besides Steve!) is the book “Reversed Thunder” by Eugene Peterson. The same Peterson whose paraphrase of the Bible, The Message, is my favorite. The words he uses are so much more accessible to me. And this book is his reflection on the last book of scripture, the Revelation of John. It is very helpful for me as one who struggles with all the imagery and code, or whatever you want to call it. And that has been my experience on a journey like this to a place so far from home. I have discovered that the gospel – this good news – has brought me into a family much larger than the one I was born into. This family has shown me by the living of this word in real life and real time, that it is for us all together. 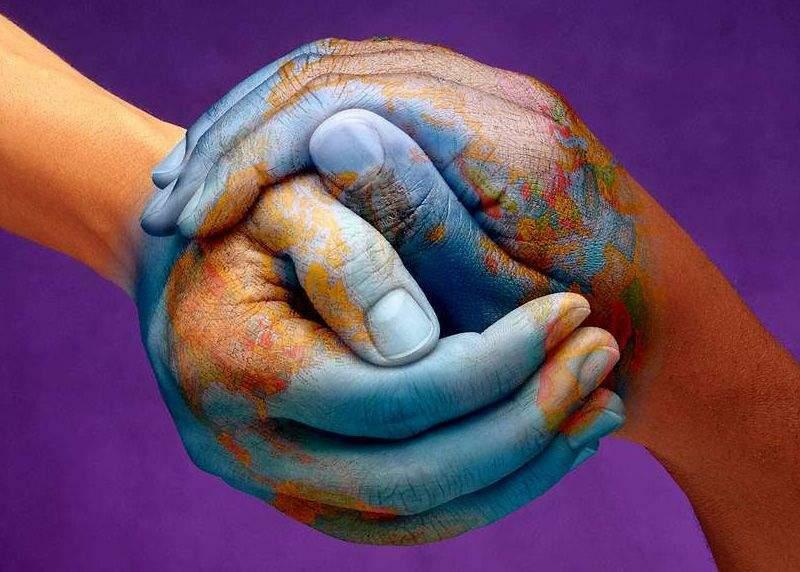 So let us not be separated by geography or culture or language. 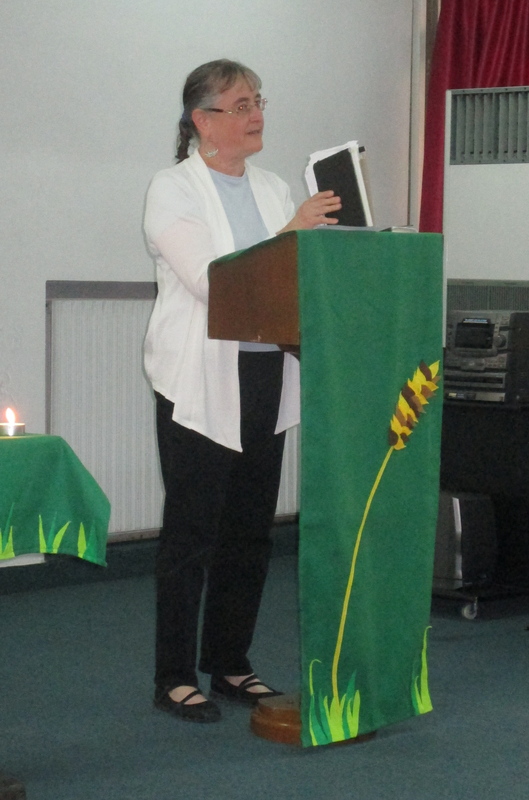 Let us be together in the word – the Word incarnate. Let us be the body of Christ. A couple of weekends ago my brother Mike took Jana and me and Barb up to Dubuque to have a quick visit with one of our favorite people, Sister Aunt Carolyn. We call her SAC for short. We came up with that acronym many years ago. The order of the letters made sense because, after all, she was a holy sister before she became an aunt to a collection of unholy nieces and nephews. It was a beautiful fall weekend in Dubuque, a city on the Mississippi known as the San Francisco of the midwest because of its amazing hills. We drove up in the hills to Eagle Point Park on the last weekend it was open for the season. We went all the way to the top, surrounded by that amazing autumnal palette of colors as the leaves were getting ready to separate from the tree branches. We looked across the river to see Illinois and Wisconsin, looking equally as beautiful as Iowa. We watched a barge go through the lock and dam on the river, its containers empty now, but headed back down the river to gather more coal to bring upriver before the season ended. Or maybe it was headed downriver to be parked for the season…I don’t really know; I’m just surmising here. From there we headed back to SAC’s apartment to pick up some furniture she had for Mike and Barb. But on the way we went by the cemetery where SAC’s mom and our grandmother was laid to rest in 1981. Grandma Thirtle (as we called her) is buried on one of those beautiful Dubuque hills next to a pine tree. I remember when she died in January that year and we headed out from Omaha to go to her funeral. Grandma Thirtle lived with us for several years when we were young. Since Grandma Piskac had died in 1965, Grandma Thirtle was the grandma we knew and remembered and made good memories with. I thought that when Grandma Thirtle died she must have been very old, as in my mind’s eye she always was old. But there on the gravestone were the dates of her birth and her death: July 19, 1908 and January 26, 1981. She was only 72 when she died. 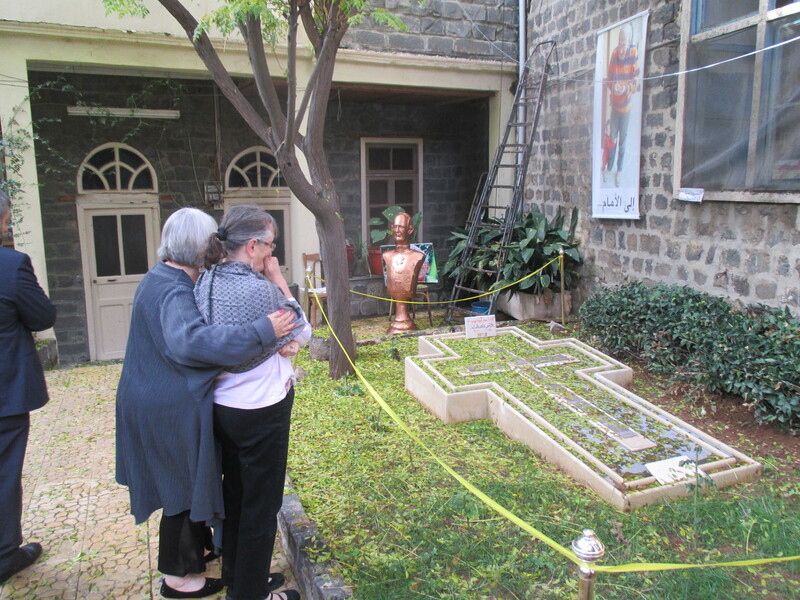 And here we were standing by her grave with her daughter Carolyn, who will be 77 next year. SAC is a really young 76-year old! And it just struck me that if she is 76, Grandma must have been much, much older than that. But she wasn’t. I said a quick prayer to myself and kept myself from crying. I have often wondered about the life my Grandma Thirtle must have experienced in her younger days. And then we went back to SAC’s apartment. She has some wonderful family pictures on her wall. One of them was so familiar as I have the whole album of originals in my possession. It is a wedding picture of my own mom and dad, George and Jeanne Prescott, taken on September 17, 1955, in St. John’s Cathedral on the Creighton campus here in Omaha. They are so young! They would go on to have the seven of us – George, Jana, me, Susan, Mike, Sally and Cathy – from August 4, 1956, to December 7, 1964. And then on March 27, 1966, my dad would sit by Mom’s bed in the hospital as she took her last breath. Still, that wedding picture makes me smile. 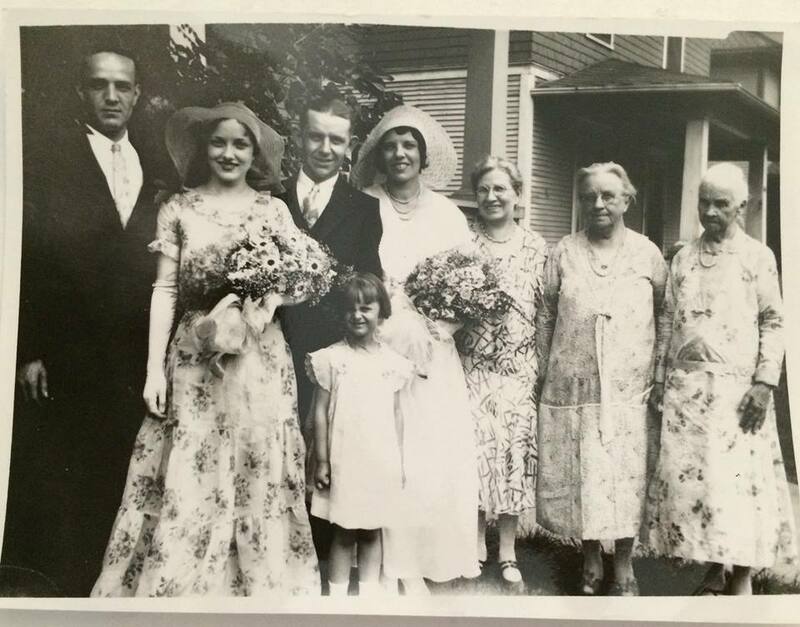 June 30, 1931, in Omaha, Nebraska, was the day my grandma, Beatrice Chicoine, married my grandpa, Robert Thirtle. She is just shy of her 23rd birthday, and there she stands in her youth, a smile on her face, standing between her new husband and her own mother, my great-grandmother, Cora Chicoine. I have never in my life seen a picture of my Grandpa Thirtle until this moment. And I have never seen a picture of my Grandma Thirtle as a young woman. And there she is, happy, radiant as a new bride. What must she have been thinking on that day in her white dress, white hat upon her head, holding onto a bouquet of flowers with a new gold band on her left ring finger? Was she thinking that when her own daughter got married some 24 years later that she too would stand in a picture smiling, while her siblings looked on? Was she thinking that she would have five children of her own? Was she thinking of the possibility that two of them would precede her in death? Was she thinking that the man to her right would cheat on her and abuse her and cause her to flee with her children for their protection? Did she know that her own mother would be her strength and protection from this man? 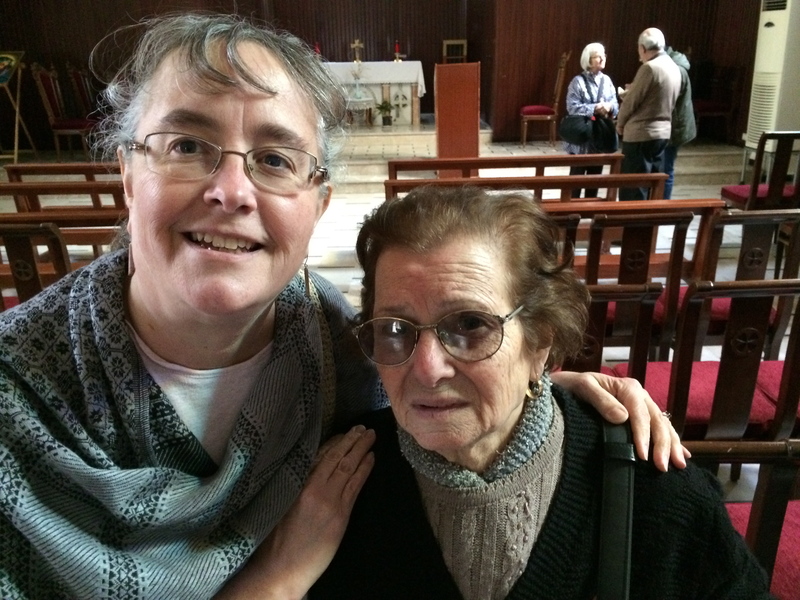 Did she know that life as a divorced Roman Catholic single mother would be as hard as it was? Did she know that she would inspire such love and loyalty from seven grandchildren who lost their own mother, her daughter, at such a tender age? Did she know that she would be the model for one of them in nightly prayers? I have never seen a picture of my grandmother so young and happy and with her whole future ahead of her. And I am so glad that on June 30, 1931, she didn’t know about that future. But there is one thing about this picture that is very familiar to me about my grandma and that is her smile. I can see that smile in my mind as we stand in her kitchen making chocolate malts. I can see that smile in my mind as she lets us take the salt and pepper shakers out of her hutch and lets us play with them. I can see that smile in my mind as she sits at the old piano and coaxes old tunes out of it as she plays from memory. I can see that smile in my mind as she teaches us how to play pinochle and canasta. I can see that smile in my mind as we ride the bus together to go downtown to shop at Kilpatrick’s and Brandeis and have a piece of pie at the lunch counter. I can remember putting flowers on her grave that cold day on the hillside in Dubuque in 1981. We had gone into a florist shop to buy roses. When the clerk heard us say what they were for, she thought it was wasteful to put perfectly good roses on a grave on a sub-zero day. But we knew better. 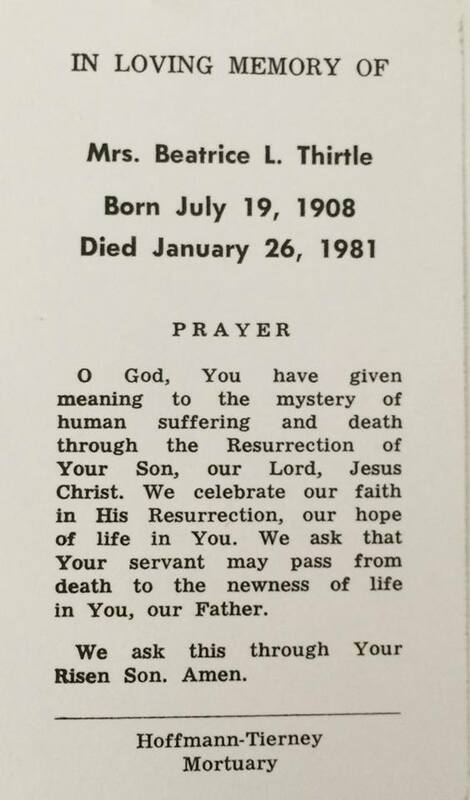 And 33 years later, I am sure Grandma is smiling. And that is how I will always remember her.